How do I know if any of my planets fall in my partner’s twelfth house and visa versa?? Wow, this is pretty powerful stuff. Thank you! Makes me feel better about my liking people with planets in my 12th–usually that gets a bad rap. my bf sun , chiron and mars fall in my 12th house ..what does this mean? I have natal Venus in the 12th house. I wish it were in the 7th. oh, well. You would need to get a synastry reading to see which of your houses your partner’s planets occupied. Your partner’s chart wheel would be placed around yours and from there you could see where his planets fell. Then the charts would be reversed (your chart wheel around his) to see where your planets fell in his chart. Accurate birth times for both partners are essential for this. Your boyfriend’s Sun and Mars in your 12th suggests he illuminates (Sun) and stirs up (Mars) any subconscious issues/behavior patterns you might have. His Chiron (the wounded healer) suggests that the place that he is most vulnerable resonates with you…. @leo female, although not a substitute for a real astrology consultation, Sasstrology does offer a Long Synastry Report (computer-generated) which – provided you give exact birth information for both parties – will tell you where your planets fall in each other’s houses, and what that means. My Saturn/Chiron in Pisces fall in his 12th and His Sun/Merc/Mars/Chiron all in Pisces are in my 12th as well as his Saturn in Aqua. That’s pretty deep, isn’t it? Yes, planets in each others 12th house definitely makes for a relationship where you get under each others skin. You are both feeling your 12th house being impacted although the experience will be somewhat different for each of you since the planets are different. Nadia, here’s my experience with the this aspect we have. I wonder if, because my Mars and Venus are both in his twelfth house… that’s where my Venus feels most comfortable With house overlays, could it possible that the position of Venus (maybe Mars?) will indicate how YOU define your relationship with another person? For example, I think I feel like I like our relationship most when we are sharing secret fantasies, deep secrets, when we are discussing our dreams… when we discuss others’ internal motivations… all 12th house things. Also, if I were to define our relationship in a sentence or two, I’d say that we have a very rich spiritual relationship that has been true since the moment we met. What do you think about that idea? Wow, this is absolutely wonderful. Thank you! My Sun, Mercury, Vesta and Chiron fall into my boyfriend’s 12th house. His Mercury, Moon, Chiron and Venus fall into my 12th house. We have both grown tremendously since we met. Like Eme, I’ve also got Venus in the 12th. Along with Saturn in 7th. double-whammy! Uranus in 7th doesn’t exactly jive with Saturn there too. Interesting read! I never though about the 12th house in such a way. My sun just barely makes it into his 12th house, while his Uranus is in mine. Are there any specifics to inner planets vs outer planets being in the partner’s 12th house? Usually how it works with house overlays is the house person experiences the planet person through the filter of the house that is occupied. So your boyfriend (house person) would define the relationship through your(planet person) Venus and Mars in his 12th. You would define the relationship through his Sun/Saturn in your 12th. I’d say your description of the relationship being spiritual is bang on….mutual 12th house overlays will bring a strong spiritual/karmic tone to the relationship. I think the mutual 12th house overlay you have w/your boyfriend means you would both find it fairly easy to share (talk….Mercury)hidden parts of yourselves with each other. Please keep in mind though that the rest of your charts will impact this as well….natal charts work as a whole unit, so all the houses, signs, planets and aspects work together. No, there aren’t really a different set of rules for outer vs. inner planet house overlays in this case. I say this because, while outer planets can often be experienced as a more generational kind of energy it really depends what other aspects his Uranus would be making to the rest of your planets. But it seems that the 12th house in my chart is very positive: with jupiter and capricorn. It relates to my choice of the healing profession and psychology. My friend once told me that having capricorn in the 12th relates to a need I have to bridge between idealism/fantasy and reality: What are your thoughts on this? It’s a very strong placement in my life. Everything I do surrounds the thought: how much closer can I bring reality to the ideal… and where is the magic in this world? Possibly because I have a lot of sag in my chart and jupiter is in my 12th house!? magic, fantasy, idealism but all in a very earthy and realistic person. A guy I know who I feel electric with Has Jupiter in Gemini in the 12th house..
Hmmm I see a Pisces casually and I am a Virgo Aquarius rising, but I notice Pisces is my 7th by birth chart? But in general the 12th house. What does this mean? Capricorn in the 12th can mean a few things…adding structure to fantasy, hidden structures, someone who is more conservative then they first appear, etc. It really depends on what’s happening with the rest of your chart. But if you look for these qualities in a partner I would say there’s a connection to your 7th house and/or your Mars sign. He would expand the part of your life ruled by the 12th house. If you re-read my article that should explain it. So what does it mean if you and your partner have the same sign in the 12th house? It would mean that you have similar 12th house issues to work through. Nadia — I *love love love* your article, so well written, informative and poetic. The 12th house has been so badly misconstrued, I believe, by astrologers writing on-line, it’s hard to separate the wheat from the chaff. 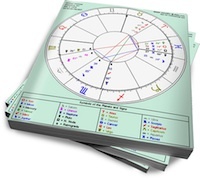 What other factors in the synastry chart would indicate a trigger of either the “shadow” elements of the 12th house or the positive aspects as you detail in your article? You have given me hope; the fellow I’m dating, he has an Aquarius stellium in my 12th house comprised of his sun, moon, mars and mercury (all in Aquarius and all in my 12th!). One astrologer told me that the “promise of the two charts” is that he would betray me in the worst manner possible. Thanks..it’s always good to hear that my writing has a positive impact. 1) how you handle your own 12th house energy: I would look at the sign that rules your 12th (sounds like Aquarius in this case but to be sure it would be whatever sign the cusp of the 12th was in). See what’s happening with the ruler of that sign (if it’s Aquarius it would be Uranus) in your chart. What house is it in, what aspects does it make to what planets, etc. Also, if you have any planets in your 12th that would tell you a lot. Always go back to your natal chart to see what’s happening in areas activated by others. 2) what aspects do his planets in your 12th make to your other planets and points: see if his planets make a lot of hard (squares, oppositions) or easy (trines, conjunctions, sextiles) aspects to your planets or is there a mix. Hard aspects indicate more disruption, easy aspects indicate harmony. Having said this, in no way do hard aspects=bad. It all depends on the planets involved. See if his planets in your 12th contact your North or South Nodes in any way (this says a lot about past life involvement (South Node) or future growth (North Node). This is just a very brief list off the top of my head….there are many more factors depending on the rest of your charts. My guess is the astrologer you saw was getting the “betrayal” idea from the traditional association of the 12th house with hidden enemies and secrets. Of course there’s so much more to the 12th then that (as we’ve seen)! I have my sun and venus in libra and they’re both in my 12th house. What does that mean? Nadia — thank you so much for your wisdom. 🙂 I really, really love your insight. @Nadia. Well this explains a heck of alot considering my boyfriend’s Sun and Mars light up my Leo 12th house. It can be unnerving at times, but I tend not to shy away from the 12th house part of life. He does get under my skin in a BIG way, but it’s like he scratches some deep seated itch. Thanks Nadia. Gemini is in my 12th house and i stayed true to the meaning….the further i live from my family, the better the relationship with them. My capricorn moon lands in my bf’s 12th house and his libra pluto lands in my 12th. My sun and mercury (both virgo) are in his 7th and his aries moon is in my 5th. We have only know eachother for a month and have been dating 3 weeks, but we both feel a very strong connection. A few of my friends have commented that it seems like we are too serious too soon. Is there a karmic connection? I met a man about a month ago and we have been dating for 3 weeks. We both feel a very deep connection already and a few of my friends have commented that it seems too serious too fast. I was wondering if it is due to some of our house overlays. Sorry about the double post. The first one said error so I rewrote it. 12th house overlays can have a compulsive quality and since they are hidden your friends cannot see everything that’s going on. But you’d really have to look at all the inter-aspects between you and he to get the full story. i have Capricorn in my 7th & 8th houses and Taurus in my 12th…i’m seeing a Taurus right now but haha, we’re VERY far from being ‘the ultimate’ others…nooo way. my 2nd house is Cancer…sigh. ascendant in Cancer, Moon in Pisces…jell-o all the way!!! My Sun, Venus, and Mars are in Libra. (Sun and Venus in my 12th house, Mars in my 4th.) My partner (I’m a woman) has no personal planets in Libra but her 12th house is Libra so my Sun, Venus, and Mars are in her 12th house. She has her Sun, Venus, Mercury, and Jupiter in Aquarius which is in my fourth house. What does this all mean? Thank you for giving great explanations. I enjoy reading your response to others’ questions. You both impact each other on a deep level but in a different way. Your planets in her 12th mean that you have access to the hidden side of her (subconscious) while her planets in your 4th indicate that she brings up childhood/family issues for you. To put it another way, you touch her on a spiritual level, she touches you on a physical/root level.